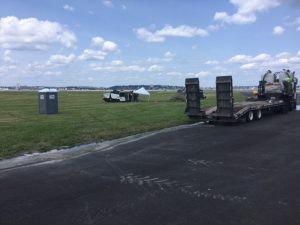 The Runway Status Lights Project just broke ground with in the last week. The new shelter foundation location is being excavated and prepped for concrete work. The horizontal directional drilling has started at night with successful, crossings under Taxiway Kilo for the GilaDuct conduit. Once the conduit gets installed, McCourt will then excavate and backfill conduit trenches along the runways.